T'ang Court - The Langham, Hong Kong is not available through our online partner for your requested time. 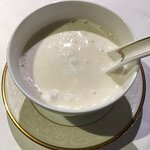 Description: Adding to a number of accolades, T'ang Court has been awarded Three Michelin Stars in the 2016 Michelin Guide, Hong Kong and Macau. 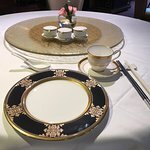 Currently one of only three Cantonese restaurants in the world to achieve this accomplishment, the legendary T'ang Court reflects the classic timelessness of the Tang Dynasty, China's golden age. 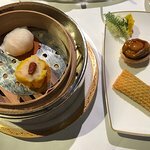 Amid lavish furnishings, dine on authentic Cantonese culinary masterpieces in this Michelin Star Hong Kong restaurant. 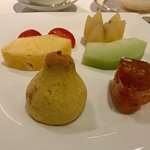 We read the reviews and saw the three Michelin Star rating and thought we should try it while staying at the hotel. We had no trouble getting a reservation....that might have been a telling sign. We ordered the tasting menu which came with six separate dishes including dessert. There was nothing exceptional, it was good but not worth the price of 1,180 HD per person. I expected a lot more from a restaurant with the Michelin Stars. 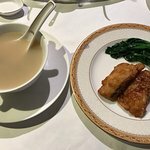 The dishes served forth from the kitchen of Tang Court are superb. 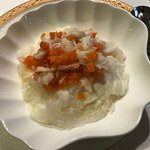 This is Cantonese cooking of a very high standard. The service is warm, professional and knowledgable. The wine list is comprehensive. 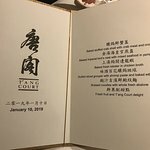 After frequent visits to all the Hong Kong high-end Cantonese restaurants, in my opinion Tang Court is the best. 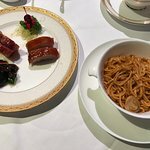 I recommend you pre-book a Peking Duck when you make a reservation. Sublime. Place looks like a better hotel restaurant, which it is. It`s not stylish in any way. Waiters are friendly but not very professional, at least on Michelin scale. Dishes are presented very shortly, and not interestingly. Tasting menu had 6 courses, desert was almost alike any Asian tourist restaurant (fruits and cake). No dish was excellent in any way. No petit fours, one amuse bouche. I consider it totally unbelievable this place has three Michelin stars. In Europe it would have none. Pick Tate instead, it’s a genuine gourmet restaurant! We were very disappointed at this restaurant. The food was ok. Nothing special. The part that was really bad was the ambience. The place is far from elegant. Many people from mainland China visit this restaurant. As expected, they do not know how to behave and the restaurant does not impose norms of respect and behaviour. Some customers were drunk. There was no dress code. Some customers wore underwear t-shirts. Their manners were terrible. One customer vomited on his table. A lot of noise from a wedding reception close by. It was just bad. The Michelin stars do not mean anything here. Perhaps, the administrator paid the Michelin to give them the stars. 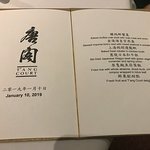 Been to T'ang Court - The Langham, Hong Kong? Share your experiences!